For this longtime Entourage user, the key feeling I get from Entourage 2008 is refinement. It feels smoother and more elegant than previous versions of Microsoft’s e-mail, task, and calendar manager, without sacrificing the power to which Entourage users have become accustomed. Though it doesn’t sport as many flashy new additions as the rest of the Office 2008 programs (such as the Elements Gallery and Smart Art), the new Entourage does have useful new features which will win it converts. My snap impression of Entourage 2008 is that it finally looks like a native Mac application. Like the rest of Office 2008, Entourage is now a Universal Binary, running equally well on Macs based on Intel and PowerPC chips. Part of that transition also led Microsoft to adopt a standard toolbar. Like most other applications, you can customize the toolbar to show icons or small icons, icons and text, or just text buttons, and you can add and subtract buttons from the toolbar. This is especially welcome, because in previous versions, Entourage was the only application in the Office suite that didn’t allow customizing the toolbar. The new customizable Favorites Bar sits under the main toolbar, and allows you to add shortcuts to items in the Folder List, so you can get to them with a single click. This makes it very easy to jump to the new To Do List, or the Inbox, or one of your saved mail searches. Entourage’s e-mail is different in small but significant ways. New anti-phishing features automatically block potentially malevolent file attachments, such as scripts and executable programs. Microsoft updated the application’s junk mail filter, and Entourage’s product manager promises more-frequent updates to keep up with wily spammers. Some changes require a bit of adjustment, because features have been moved around as part of the program’s user interface changes. For users in corporate environments that use a Microsoft Exchange server, there are many e-mail and calendar improvements, including an Out of Office Assistant that allow you to set different e-mail replies for different recipients. It is now easier to manage meeting invitations and updates in the calendar, and Entourage works with the Exchange server to keep all meeting participants up to date with the latest meeting status. 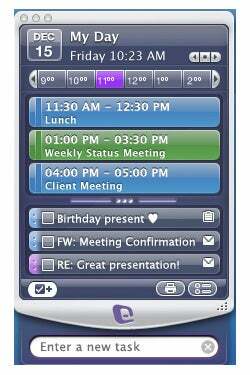 For all users, the look of the calendar has been improved, softening the frankly ugly look of the 2004 edition. The new My Day looks like a widget, but isn’t in Dashboard. It’s actually a companion application that can appear even if Entourage isn’t open; My Day displays your upcoming calendar events and To Do items. A hotkey makes My Day appear and disappear. It’s convenient to get a quick look at your schedule, but My Day is limited to viewing events, creating new Tasks, and marking To Do’s as complete. Unfortunately, you can’t create new events with My Day, and if you need more information about an event other than its name, time, and location, you must open Entourage anyway. Personally, I’d rather just keep Entourage running all the time, perhaps in one of Leopard’s Spaces to keep it out of the way when I’m doing something else. Because Entourage is a full Sync Services client, you can synchronize your Entourage contacts, calendar, tasks, and notes with Address Book, iCal and .Mac. Then you can use iSync or other software to get your data to and from your smartphone or other devices. Entourage 2008 is a fine update to an already-mature product. For most users, its improvements will be welcome, but hardly revolutionary. Still, it earns its place in Office 2008. I’ll have a final verdict on the latest version of Entourage in my full review of the product, appearing after Office 2008’s January 15 release.